The Land and Equity Movement in Uganda (LEMU) aims to secure the land rights of vulnerable persons in Uganda through harmonizing the land administration efforts of stakeholders at all levels, including: grassroots land owners, traditional institutions, local government, civil society organizations, students and universities, clans, elders, volunteers, policy makers, researchers, police, and the judiciary. LEMU works to improve practices of protecting customary land rights by making sure that the right policies, laws and structures are put in place to effectively enable the poor to claim their land rights, particularly in the Northern, Eastern, and Bunyoro regions of Uganda. LEMU serves as a link between government and communities: it brings knowledge of national laws and policies to local land owners while facilitating policy makers to understand rights and responsibilities within customary tenure and how it is changing. Formally documenting the community’s land by either registering as a Communal Land Association and/or applying for a Certificate of Customary Ownership or Freehold Title. Rampant land conflicts are the most persistent challenge to LEMU’s community land protection work. In most cases, the conflicts are not genuine disputes, but rather deliberate land grabbing attempts by powerful community members or local elites. In over 70% of the communities LEMU works in, certain individuals actively deny the community’s land rights by encroaching and claiming part or all of the communal lands as their personal property. These encroachers typically act in bad faith and frustrate any attempt to resolve the conflict, leaving communities frustrated and powerless. Efforts to resolve these conflicts using mediation or alternative dispute resolution (ADR) often fail, as these processes are non–binding. Local Council Court decisions over these conflicts are rarely enforced. Thus, the vast majority of community-initiated attempts to resolve the disputes are unsuccessful. In the face of these challenges, LEMU has developed alternative techniques to addressing land conflicts peacefully and effectively. This case summary illustrates these techniques in action in a case where a community member was attempting to claim the community’s shared land. Deliberate (Elites): These individuals use their power or influence to grab land from the community by any means, fully aware they have no rights to personalize communal land. These perpetrators are obstinate and determined. They rarely respect local authorities or customary leaders (or may themselves be local or district authorities) and are typically the first to rush to court when challenged to leave the common lands they have appropriated in bad faith, knowing they can use their money and influence to defeat the community in court. For example, one individual, Olek,  in Barapworocero Community has continuously threatened community members with violence to discourage them from using their common land. The community has defeated Olek in three different Local Council courts, but he has refused to honor the rulings and leave his encroachments. The case has since been pending in Lira Magistrates Court for the last three years, and Olek’s advocate regularly has the case adjourned. As well, LEMU has documented instances of the community’s case file “disappearing” in the court registry, a worrying sign of Olek’s influence over the court staff. Opportunistic: These individuals take advantage of a lack of strong management structures for the common land. Weak land governance and leadership often mean that there are no punitive consequences for appropriating community lands in bad faith, so opportunistic individuals may ‘try their luck’ by moving onto the community land and waiting to see what happens. In most cases, these people are following the example of “ringleader” encroachers and, when questioned or challenged, assert that they will only leave the land when the lead perpetrator leaves. If confronted, they may either abandon or intensify their encroachment. Vulnerable (Impoverished): These individuals are often elderly, displaced, poor, or internally displaced people (IDPs) from the conflict in northern Uganda who have no alternative place to live. These individuals have moved onto the community land to settle or subsistence farm. Once their encroachments are exposed, they are usually willing to leave if an alternative living arrangement is provided. On rare occasions, these people have genuine use or access rights to the common lands, but are breaking community rules regarding settlement and farming in the common grazing lands. An example of this is an elderly widow in Okeng Community (Oyam District) who gladly left her settlement on the community land once other members agreed to construct a house for her on a nearby plot of land, where she could settle and cultivate. Each kind of encroacher warrants a different strategy. The case study described below describes a deliberate encroacher, and details LEMU’s efforts to support the community to evict him from their common grazing lands. In 2013, LEMU began working with the community of Bar Kitwe, consisting of 17 villages located east of Lira in Amolatar District, to protect its communal grazing land. In the early stages of agreeing and defining the boundaries of their common lands, the community found itself in serious conflict with one of their own, a man named “Olet”. Olet had expanded his fields into the communal land, reducing the area available to the community for cattle grazing and collection of firewood, water, building materials, wild fruits, and herbs. Olet’s encroachment directly threatened the livelihoods of a number of villagers, including elders. The community and LEMU agreed that the community needed to resolve this dispute before moving forward with the community land protection process. Many years before, Olet had been exiled from his native community after repeatedly encroaching upon land belonging to others, including an elderly widow. Banished from his community, Olet came to Kitwe by way of his paternal uncle, who gave him a piece of land on which to cultivate and settle. He was a welcome member of the community, winning a seat on the Village Local Council committee and assisting in enacting community-wide rules barring individuals from selling or encroaching on communal grazing lands. But in 2010, Olet began to cut down shrubs and construct buildings for his two wives within the clearly marked and agreed-upon boundaries of the community grazing land. When rebuked by community members and elders, he agreed to return to his legitimate home site in Kitwe, provided he could have time to conduct much needed repairs on his dwellings, which had fallen into disrepair. The community assented, but rather than perform his obligation, Olet continued to farm and build in the community land. Responding to a LEMU radio public service announcement in 2011, the Amolatar District Environment Officer contacted LEMU and referred the Kitwe case. LEMU visited Kitwe in April 2013. Through interviews with clan leaders and local government officials, LEMU gathered information concerning the history of the community land and the ongoing dispute. 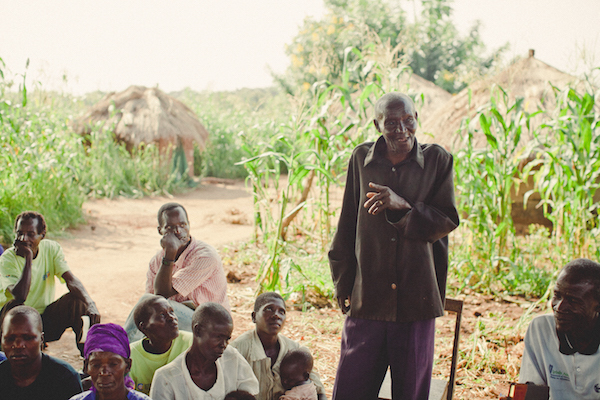 During a community meeting to introduce LEMU, Olet threatened the community and demanded compensation of 50 million Ugandan shillings for his efforts to “clear the bush.” Community leaders responded by demanding that he should leave the land immediately. As is typical in many land grabbing cases, Olet attempted to intimidate community members with violence and on several occasions also threatened LEMU staff with witchcraft and violence. He even went so far as to attempt to frame Kitwe villagers for burning his home. On May 14, 2013, Olet sought legal aid from another local NGO, misrepresenting LEMU as causing his vulnerable situation. The organization filed a suit against LEMU for criminal trespass on Olet’s behalf, but after LEMU explained the situation, the NGO dropped the suit. LEMU continued to work in Kitwe at the request of the community, assisting all 17 stakeholder villages to map and agree on the boundaries of the communal grazing land. But due to increasing hostility between Olet and the community, LEMU withdrew from Kitwe, fearing for the safety of its staff. LEMU’s withdrawal emboldened Olet, who claimed victory over what he claimed was illegitimate NGO influence. Olet’s behavior now increased from land grabbing to theft; stealing farm implements and animals from his neighbors who, seeking to use the community land, found themselves “trespassing” on Olet’s “private” land. Tensions mounted until one day in June 2014, when Kitwe community members informed LEMU that the community was preparing to lynch Olet. The community had become impatient with the dispute resolution system and demanded action. Concerned for Olet’s safety and the stability of Kitwe, LEMU returned to the community to assist and monitor a community hearing to resolve this longstanding dispute. Recognizing the urgency and potential for violence, LEMU appealed to the Resident District Commissioner (RDC), District Lands Officer, District Environment Officer (DEO), and District Police Commander (DPC), to intervene swiftly and effectively. LEMU notified and gathered local government and police officials to Kitwe for the emergency meeting. At the meeting, the community— now with the backing of the RDC, DPC, and DEO—issued Olet an ultimatum of two weeks to remove himself and his buildings from the communal grazing land. He was ordered to stop cultivating the encroached lands, return any stolen tools and animals, and to never encroach again. Should he be found cultivating communal lands again, he would be arrested and imprisoned according to the Provisions in Section 92 of Uganda’s 1998 Land Act. This strategy seemed to have the desired effect in the short term. Previously, Olet had disregarded the community’s warnings and LEMU’s efforts to mediate the dispute because he knew that an NGO has no legal mandate to evict encroachers. “Yes, let’s go to court, where I know the issue can take even more than 100 years before being resolved. By then, all of you will be dead,” Olet had declared. By bringing a team of District leaders and officials, LEMU changed the game. Olet realized these authorities were acting within their mandates, and that he had to leave. He even signed a resolution written by the RDC stating that he would leave his encroachment in two weeks’ time. The people of Kitwe were now fighting Olet’s illegal power with legitimate power. Three weeks after being ordered to leave the communal lands, however, Olet remained defiant. He claimed that the judgment did not give him enough time to remove himself and his two wives from the land and sought the help of a lawyer, claiming wrongful eviction by the community. In July 2014, leaders from Kitwe returned to the RDC and LEMU, reporting that instead of leaving the land as promised, Olet had begun to cultivate an even larger section of the grazing land. After the involvement of many actors, the dispute is still not resolved and the community’s land rights remain vulnerable. Moving forward, the Resident District Commissioner has requested that LEMU provide a legal opinion on the Kitwe case so that his office can pursue the case in the justice system. This represents an important “win” for community land protection: a district official is taking up his role to protect community land rights by using official legal channels. LEMU is continuing to advocate for appropriate action by law enforcement. Even with the challenges of this case, this approach has several key strengths. First, LEMU was able to quickly assemble District officials to address the situation when it turned critical because LEMU had built relationships with the officials and they genuinely supported LEMU’s mission and the community’s demands for justice. LEMU fostered and modeled responsive governance and respect for the rule of law by channeling the demands and needs of the community to the responsible government office. LEMU does not strive to solve problems directly on behalf of communities; rather, LEMU aims to strengthen the rule of law and accountability of leaders by connecting communities to state and non-state resources and offices mandated to protect their land rights. This approach is ultimately more sustainable and empowering for communities. However, through the case of Kitwe and others like it, LEMU has learned that conflicts over community lands are typically symptoms of a larger problem: lack of effective intra-community governance. Without community-agreed rules and management structures in place, any dispute resolution is ad hoc and temporary at best. The decision by District officials in this case entrenched divisions between Olet and the community by creating ‘losers’ and ‘winners.’ The decision was imposed and not internally negotiated or motivated, and as such did not ultimately solve the conflict. As the LEMU staff working with Kitwe observed, “A change of heart is more sustainable than following orders. Yet this is not easy in cases of bad faith—the softer you are with people like Olet, the more time you give their encroachment to grow roots.” LEMU has found that simple verdicts, like the one in this case, that leave encroachers to reintegrate into their community after a prolonged and painful dispute is both risky and complex, especially where no rules or governance structures are in place to manage the community land. To address this, LEMU is working with Kitwe to address governance gaps, challenging community members to channel their frustration into a process of drafting a comprehensive set of rules and electing a representative committee to govern the communal land. To motivate this work, LEMU explained that although Olet is the encroacher ‘of the moment’ there will be future encroachers unless Kitwe can establish strong and effective community land governance mechanisms. LEMU has also learned that it is necessary to keep every stakeholder (government, courts, police, and community members) involved in a land dispute -resolution process. Land governance and leaders’ accountability is weakened significantly when any stakeholder is left out of the dispute resolution process. In order to identify all stakeholders and support their involvement, it is necessary to understand and respect both the context of the land dispute and the history of the community. Taking the time to build strong rapport with the community—much of which involves listening to and incorporating communities’ needs and ideas—is essential to a successful result. Such efforts require sensitivity and adaption to community dynamics. Based on its experiences in the field, LEMU has developed a process and tools to analyze encroachment conflicts when one is encountered during the early stages of the community land protection process. LEMU staff undertake the following analysis steps and use that information to determine appropriate next steps. Whether there is any perceived “power” which the perpetrator is using to make the community vulnerable and unable to defend itself against encroachment, and the source of that power. Support community members to seek enforcement by state law authorities. In Uganda, the relevant authorities include the District Environment Officer (for cases involving wetlands), the National Environment Management Authority, and police. With community members and leaders, LEMU staff document and share the facts of the encroachment case with these authorities, and bring their attention to national laws that mandate them to act to protect community lands owned under custom. Support the community to file a representative suit in court or in a Land Tribunal, if state law enforcement does not help. This is a last resort option, as litigation takes a great deal of time and money, and there is a risk of judgments going unenforced. Alternatively, a community may ask to take the case before the Resident District Commissioner (RDC). While this representative of the President does not have legal authority to decide land cases, this appeal to political power may sometimes pressure resistant encroachers to leave “voluntarily” after the RDC gives a warning. Meanwhile, continually seek ways to reconcile the deliberate encroacher or to inspire a change of heart to ensure harmony in the community even after a court or administrative judgment. Conducting visioning exercises at the village level to involve more people and build a broad base of awareness and support (working with clan leaders and Local Councilors). Continuing to support the community to draft and adopt rules for the administration and management of their common lands and elect a strong land management committee. Community power should also be strengthened with support from external authorities. Resolving conflicts over community land is not always easy and may require sustained pressure from all angles. A community must be committed to sacrifice time and energy in order to secure their land from ongoing encroachments. In some cases, encroachers voluntarily leave when confronted, but in others, intervention by state law enforcement authorities is necessary, and is mandated by law. There is no one-size fits all strategy to resolve community land encroachments. Rather, LEMU tailors its response based on our assessment of the situation on the ground. It is particularly important to understand what is motivating encroachers and the strategies they use to protect their interests. LEMU uses a framework of three categories of encroachers (‘vulnerable’, ‘opportunistic’, and ‘deliberate’). Based on which type of encroacher is involved, LEMU either attempts to defer the conflict resolution process until the community can address it internally or, if the conflict threatens to seriously undermine the community’s land protection efforts, LEMU takes a more involved, proactive approach to addressing the conflict. LEMU is continuing to test and monitor our encroachment conflict assessment tools and approaches. With further field experiences to inform us, we plan to further refine our responses to encroachment conflicts so as to most effectively foster authentic peace, governance, and protection of community lands and resources. LEMU understands “land grabbing” as the illegal and opportunistic act of depriving someone of land rights; while “bad faith” describes the dishonest or obstructive way someone approaches the dispute resolution process. Land grabbing is considered a crime under Section 92 of Uganda’s 1998 Land Act (Cap. 227), which states that “a person who… makes a false declaration in any manner relating to land” or “wilfully and without the consent of the owner occupies land belonging to another person”… “commits an offence.” Notably, however, the Penal Code Act does not mention land-related crime or theft, robbery, or grabbing of immovable property. This discrepancy is problematic. See J. Akin (2014), “Power & vulnerability in land dispute resolution: Evaluating responses to domestic land grabbing in northern Uganda”. A publication of the Northern Uganda Land Platform. All individuals’ real name have been changed for confidentiality purposes. Communities depend on their communal grazing lands for many livelihood resources such as; pasture and water for animals, building materials, timber, water for domestic use, wild fruits and vegetables, edible insects and birds, recreational activities and craft materials. The RDC is appointed by the President to serve as his representative in each district. The RDC is chief executive, primarily responsible for security issues in his jurisdiction. Olet was involved in an earlier court case between him and a community member bordering the community land. When the judge dismissed the case without costs, Olet returned to the community celebrating that he had “won the case”, later even holding a “Thanksgiving” service at church. This disappointed the community, who felt that they could not rely on such a corrupt justice system. Research by J. Akin (2014) shows that compromises reached through alternative dispute resolution often fall short of protecting land rights because they do not address the underlying culture of impunity on the ground. This is especially apparent in situations where parties exhibit defiance or predatory motives. For such cases, some kind of appropriate dispute resolution (ADR) is needed. Since mediation and alternative forms of dispute resolution rely on parties’ willingness to negotiate in good faith, cases involving ‘bad faith’ and land grabbing—where powerful parties deliberately exploit someone else’s vulnerability in order to illegally claim land—pose a serious challenge for local land rights practitioners like LEMU. Community Support Persons are trained community members who function like grassroots paralegals to help their community navigate the Community Land Protection process and motivate them to complete each stage.